Heat oven to 375°F. Beat sugars, peanut butter, butter, shortening, vanilla and eggs in large bowl with electric mixer on medium speed until creamy, or mix with spoon. Stir in flour, oats, baking powder and baking soda thoroughly. Stir in candies, peanuts and raisins. Drop dough by rounded tablespoonfuls about 2 inches apart onto ungreased cookie sheet; flatten slightly with fork. Bake 9 to 10 minutes or until light brown. Cool 1 minute; remove from cookie sheet to wire rack. You can add another grain by replacing 1/4 cup of the oats with wheat germ. 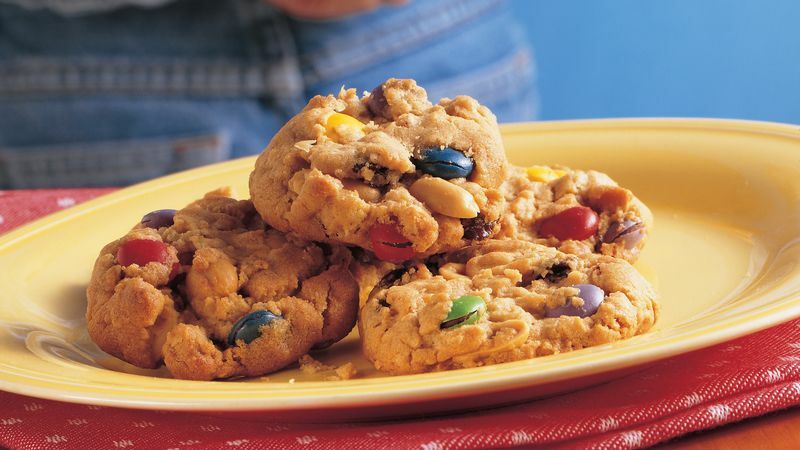 Next time you make the cookies, replace the raisins with mixed dried fruit pieces.